Henry J. Finkel was born April 20, 1942 in Union City. A dominant high school center for Holy Family High School, he grew to 6–11 as a senior. Hank decided to stay local and enrolled at St. Peter’s in Jersey City. He dropped out after his father died, and took a job in a shipyard. Hank was enjoying an ice cream cone with his buddies when he was spotted by Harry Brooks, a former Seton Hall player. Brooks was a bird dog for Dayton coach Tom Blackburn, a school familiar to Hank because they had just won the National Invitational Tournament in Madison Square Garden. Hank was on his way to the Midwest soon after. Hank ascended to the varsity at the same time as Don Donoher, who replaced Blackburn after he was diagnosed with cancer. Donoher would go on to become an NCAA coaching legend. In 1965–66, Hank’s senior year, the Flyers made it all the way to the NCAA Final, where their amazing run ended against UCLA. Hank graduated with 1,968 points—third most in school history—and led the team in scoring in all three varsity seasons. His 23.7 career scoring average is still the highest ever for a Flyer. 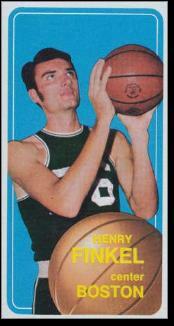 Hank was taken in the second round of the 1966 NBA Draft by the Los Angeles Lakers. He played sparingly in his first pro season, and was exposed in the 1967 expansion draft. The San Diego Rockets grabbed him and he played two seasons before the Boston Celtics purchased him for cash. For the next six seasons, Hank served as Dave Cowens’s backup. He averaged about 5 points and 4 rebounds a game for his career, and was a member of Boston’s 1974 championship team. Hank was known for his skill on the pick and roll. He was a left-handed shooter, which meant he could execute this play from a spot defenses were unused to. After basketball, Hank stayed in the Boston area and focused much of his efforts on charity work. He also worked as a broadcaster for Sportschannel and the Celtics, and later did some advance scouting for the Cleveland Cavaliers. His company, Hank Finkel Associates, sells office furniture and business equipment.